Nearly 170 years ago, the people of Hungary revolted against their Austo-Hungarian government. It didn’t end well for them, but the country remembers, and practically everything was shut down in Budapest today as people filled the streets to continue the traditions of wearing tricolor cockades and giving speeches in front of Parliament. Lucky for us this also means that many museums are free, and since most of the transportation workers have the holiday off, public transport is essentially free as well. 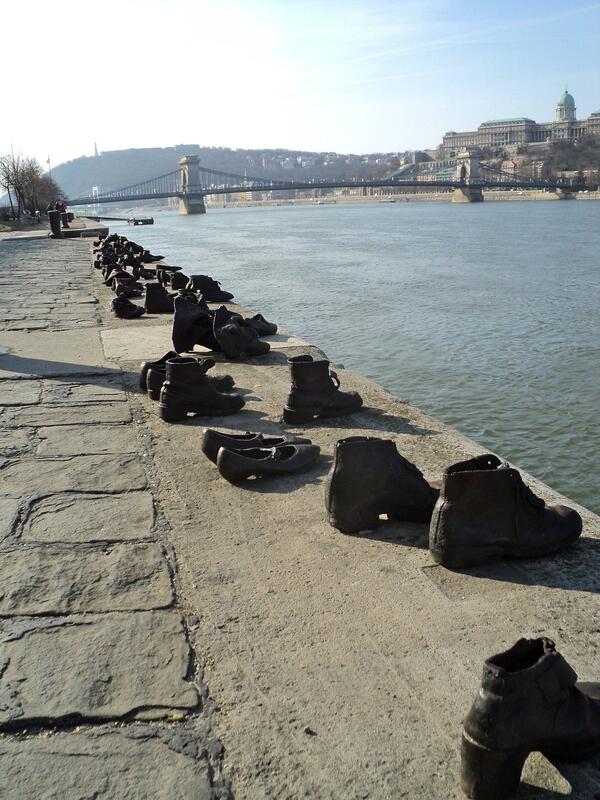 I got up early and headed down to the Danube Promenade to see if I could get some good photos of the shoes before they were crowded with tourists. Having woken up (by accident) at 6, I was so early that I actually beat the sun as it rose over the buildings on the eastern side of the river and had to wait for it to light the shoes a bit. I do really like this sculpture. 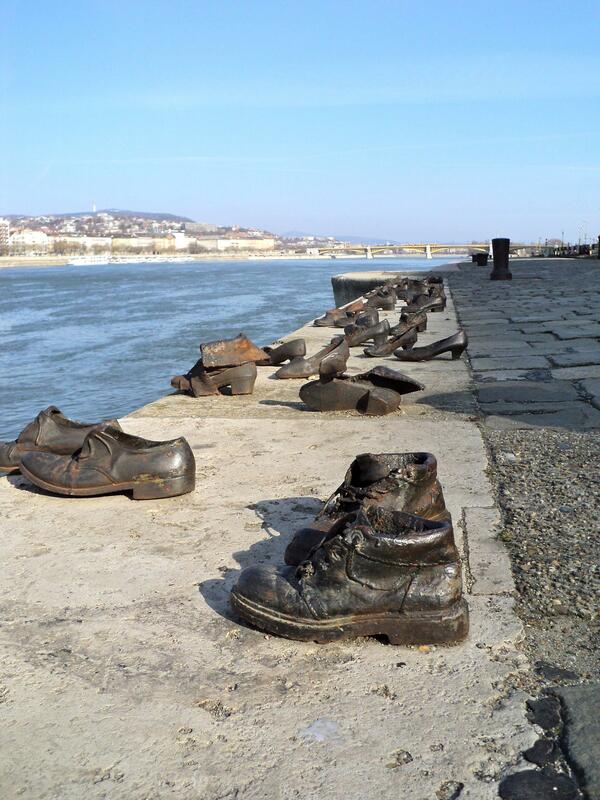 The shoes seem crumpled and decayed, as if they really had been standing there by the riverside since 1944, just waiting. Eventually, my friends arrived via metro and we walked across Kossuth square. 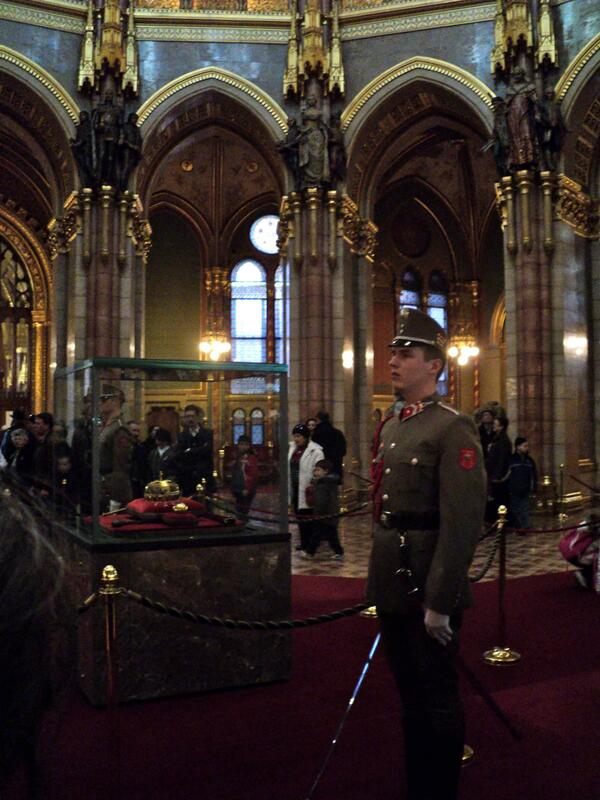 The crown jewels of Hungary (which no longer adorn a head, since Hungary has not had a reigning monarch since 1922) reside in the great domed hall of the Parliament building, and on March 15th, there is no charge to visit them. So we waited in line, passed through a handful of metal detectors, and followed the largely Hungarian crowd into the domed hall. The Holy Crown of Hungary (holy because St. Stephen wore it at his coronation) is a funny artifact, slightly crooked and with large asymmetrical stones around the rim. But it’s theirs, and also holy and so beyond criticism. In my sadly flash-less photo, you can also see the orb of office, and the handle of the golden scepter. 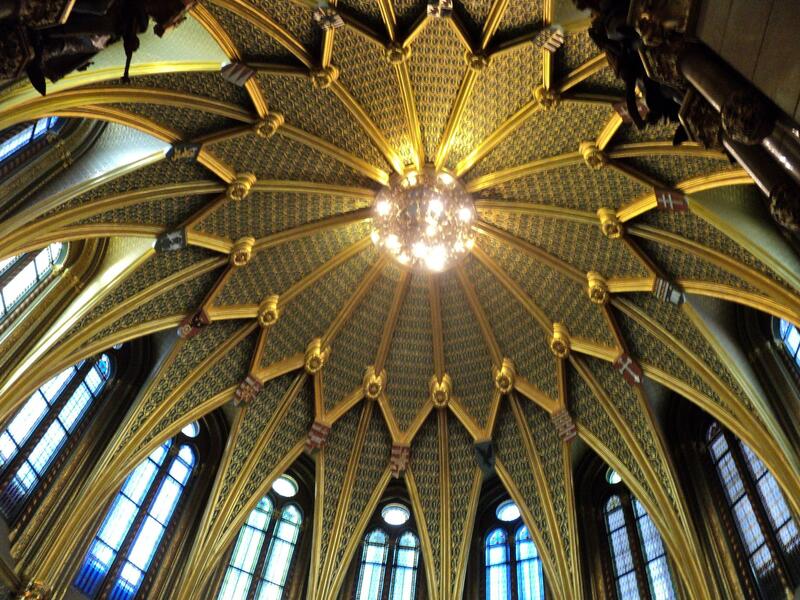 Once we had our fill of gawking at the lovely domed ceiling and trying to discern which of the sixteen carved kings was which (pretty sure I can tell St King Stephen, Prince Rákóczi, and Matthias Corvinus, but I was lost on the other ones. 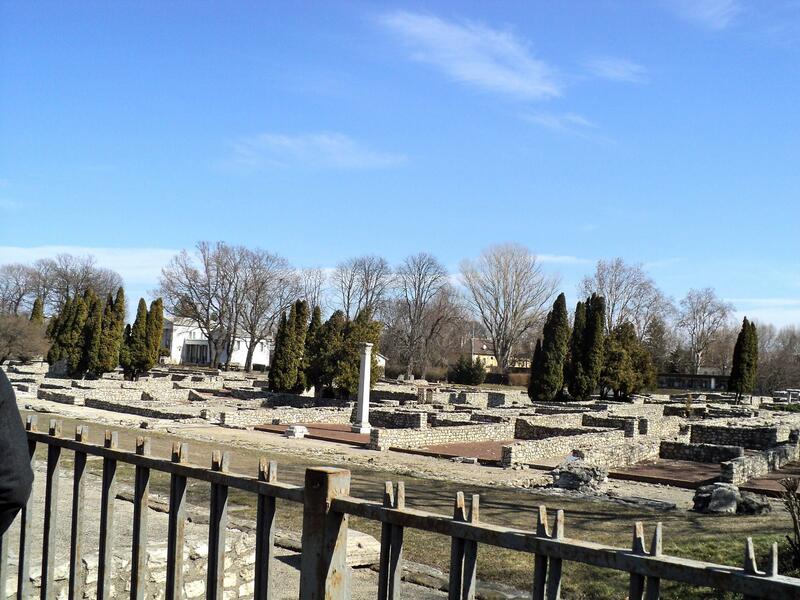 ), we got on the suburban railway and rode up to Aquincum, now a suburb of Budapest, formerly a military encampment and town at the very eastern edge of the Roman Empire. The amount of Roman artifacts that continue to be found with every construction project in the area (and even across much of Buda proper) is pretty amazing for a city so far from Rome. But then again, Romans loved their baths, so maybe it’s not so surprising. Raymond, Amy, Will and Michaela visit the ruins. Some of the excavated ruins (with some reconstruction, obviously). These are the remains of a large bath, and some houses nearby. 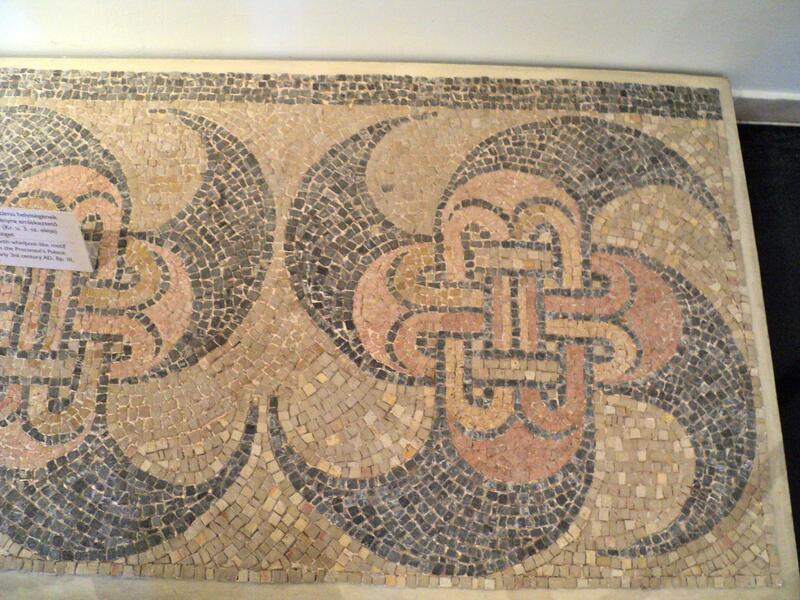 Floor mosaic with double-snake knot motif, from the hearth of a Roman house. The coolest thing at the Aquincum museum was this incredible water-pump organ. Apparently the organ was given as a gift to the Aquinicum fire brigade by a wealthy citizen, and when the settlement later burned down seventy years later, the fire brigade headquarters and organ burned too. 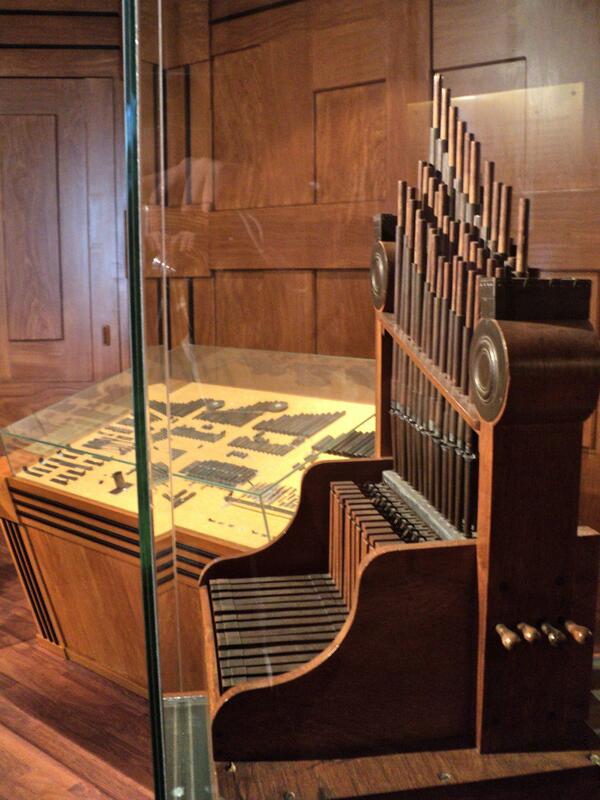 The metal pieces of the organ lay undisturbed until 1931, when they were dug up. This photo shows the metal pieces of the original organ in the background and the working reconstruction in front. It’s really cool to have a complicated instrument like this from so long ago, particularly because very little of Roman music is known–less even than the ancient Greeks. The second coolest thing at the museum was a copy of this incredible 5th-century map of the Roman empire, rendered as a long ribbon of parchment suitable for rolling into a scroll. It looks like nonsense at first, because of course the earth isn’t shaped like that. But it actually makes a fair amount of sense, as a general reference, because the roads are all straight lines. You can see it here. Rome is smack in the center (labeled Ro ma with a king sitting in the middle) and Aquinicum is up and to the left of him, two red-roofed houses labeled Aquinco. I like it. Busy day, right? Hold onto your hats, there’s a part II. Thank you for the pictures of the shoes on the promenade! Your pictures are much better than wikipedia. I also like the organ and the map! Very interesting post!